Liquid Proust Teas has provided me with Nostalgia for the purposes of providing an honest review. Like with the first Liquid Proust Tea I reviewed (Smoked Breakfast), the bag is very sturdy and a bit tough to open (at least it’s air tight?). It has a very subtle aroma, no perfumed smells to overwhelm the senses here! The tea itself smells sweet, it reminds me quite a bit like the smell of lychee and it comes off as ‘fruity’ to me, despite not being an herbal infusion at all. 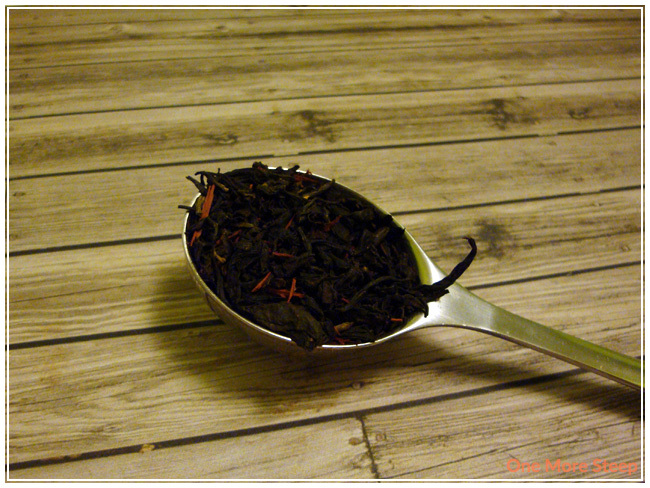 Nostalgia contains the following: 2012 Da Hong Pao oolong, Fujian black tea, and red sandalwood. 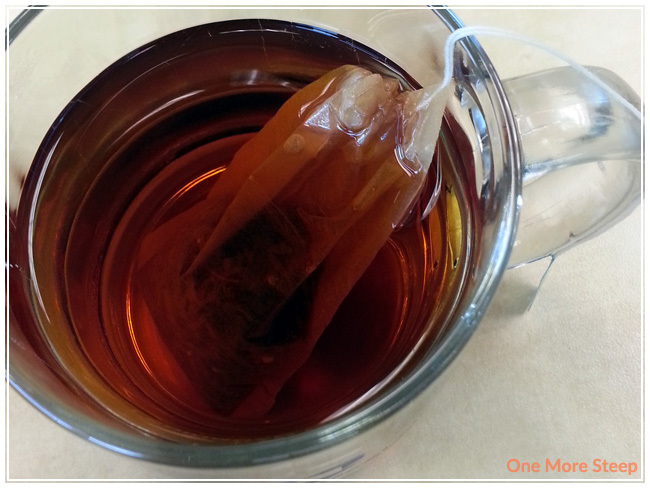 This is my first time trying a tea with Da Hong Pao oolong and red sandalwood. 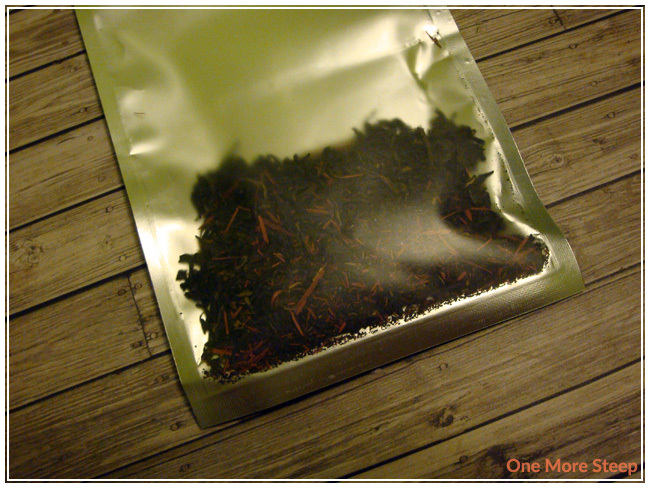 It is a pretty tea, the red sandalwood gives nice bright pops of colour in the otherwise very dark tea leaves. I’m not too familiar with red sandalwood so I’m not sure if what kind of smell it should have on its own, but I don’t smell anything that reminds me of wood in this tea – it does make the tea look prettier though. Liquid Proust Teas recommends steeping Nostalgia in 205°F (96°C) water for 2-3 minutes. I steeped it for about 3 minutes. Nostalgia had a very light scent when steeping – I couldn’t quite place my finger on what it reminded me of. It almost had a light earthiness quality, as well as smelling like black teas that I’ve tried in the past. The tea steeps to a warm brown colour that is very inviting. Nostalgia has a very smooth taste, there’s no bitterness that I noted. There was a slight astringency at the end of each sip that was primarily quelled by drinking more of the tea. While it had smelled a bit fruity to me prior to steeping it, I didn’t note any lychee qualities to the tea when drinking it – I didn’t really expect any as it wasn’t listed as an ingredient, but it did have the fruity floral scent to it when dry. After I finished my first cup, I wanted to see how it would resteep so I had another steep of Nostalgia. Nostalgia does really well with resteeping! I tack on another 30 seconds of so of steeping time for each subsequent cup, I resteeped this tea two more times and it tasted exactly the same, which is a nice quality to have in a tea. I thought that Liquid Proust Teas’ Nostalgia was just okay. It’s a beautiful tea and it resteeps really well if you’re looking for a tea that will last you throughout your day. While I did find the flavour of the tea quite enjoyable, I was not a fan of the astringency sensation that I get from this tea.